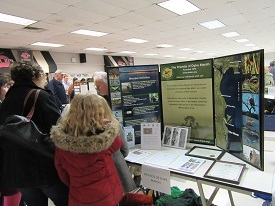 In the photo at left, FODMer Dorothy McManus and Cathy Ledec greeted visitors. Cathy is a FODM member and president of the Friends of Huntley Meadows Park, a "sister" organization. 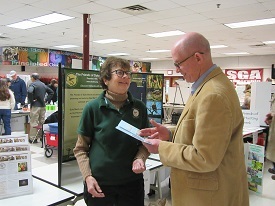 Dorothy McManus discussed FODM activities with Don Hinman, among many other people who visited the FODM table and display. FODM Vice President Ned Stone greeted a group of youngsters, mothers and many others. 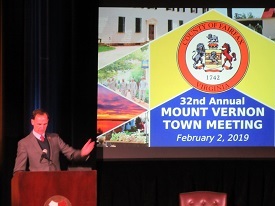 Supervisor Storck presided over the town meeting and led a virtual aerial "tour" of Mount Vernon District. He included the Dyke Marsh restoration project and expressed his support.